I love Homemade Garlic Bread. I tend to use a lot of butter. I know, I know, not really healthy, but definitely delicious. If I ate this all of the time it would be an issue, but I might make and eat Garlic Bread twice a year. Not to bad when you put it in that context. Anyway, today I am posting my really easy Homemade Garlic Bread Recipe. Cut loaf of Italian Bread in half. Broil for 3 to 5 minutes until lightly browned. Watch the bread, it burns easily. Take bread out of oven and serve. Okay, so was that easy or what. 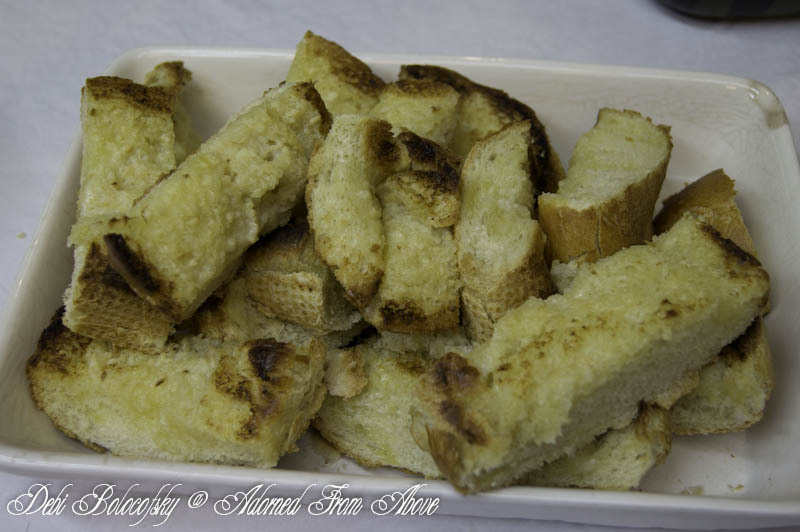 I hope that you enjoy this recipe for Homemade Garlic Bread. Let me know what you think. I always love hearing from you. Nice and easy - and very, very tasty! Add a bit of cheese and you're away! Thanks so much for visiting. You are right that cheese would make it great, I just don't use it a lot because my husband is allergic to cheese. I will post another garlic bread recipe that is covered with cheese later, and you should love that one. Ohhh I looooooooooooove homemade garlic bread. It's sooooooooooooo delicious. I love garlic bread also. I could eat it all, it is so good. No, cheese would put this over the top, I just didn't use it this time, because my husband is allergic and it was his birthday party. I have another great recipe that I will post later, that is loaded with cheese, so check back. I too love homemade garlic breat. And yes, it's all about the butter! lol! Thanks for sharing with SYC.